This quote from Thabo Mbeki, the former president of South Africa, concludes the recently released video “Stop the Bleeding– Curbing Illicit Financial Flows,” and for good reason. Instead of concentrating resources where they are needed most, these “islands of wealth” actually drain resources out of the African continent. The video notes that Africa loses $50-80 billion each year to illicit financial flows, while Sub-Saharan Africa only receives $40 billion each year in official development assistance. The damaging effects of IFFs in Africa have been the subject of increasing attention across the continent. This video, produced by the UN Economic Commission for Africa (UNECA), details this immense problem of illicit financial flows leaving Africa and the work of the UNECA’s High Level Panel on Illicit Financial Flows from Africa. Chaired by President Mbeki and including GFI President Raymond Baker, the High Level Panel has been integral to giving more prominence to the issue of illicit financial flows since its creation in 2010. A coalition of African organizations formed a civil society campaign in 2015 called “Stop the Bleeding” to draw attention to the billions illicitly flowing out of Africa each year. While the term illicit financial flows hardly existed a decade ago, it is now discussed by top multilateral organizations, and the reduction of illicit flows is included in Goal 16 of the Sustainable Development Goals (SDGs). As the video notes, stemming illicit financial flows is important to achieving the SDGs. According to the UN Conference on Trade and Development (UNCTAD), it will take $2.5 trillion every year to achieve the SDGs, and domestic resource mobilization remains far below this level. GFI estimates that IFFs reached at least $1.1 trillion in 2013. The problem is getting worse: IFFs have been growing in recent years, and reducing them would play a significant role in closing this financing gap for the SDGs. 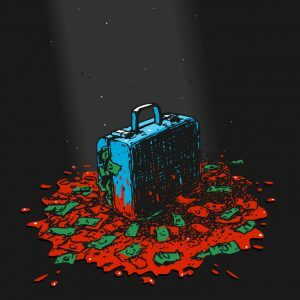 “Stop the Bleeding” highlights several ways illicit financial flows could be combatted in Africa. First, African countries need to implement effective laws to prevent illicit financial flows and strengthen their capacity to enforce those laws. Second, there must be sufficient space for civil society and a free press to hold governments accountable for financial transparency. Last, in addition to effective laws and governance, President Mbeki calls for a moral offensive to highlight how illicit financial flows stall development, increase poverty and inequality, and contribute to preventing hundreds of millions of people from accessing the opportunities to reach their full potential. While curtailing illicit financial flows certainly won’t eliminate all injustice on its own, it can help get us closer to a world where poverty is a speck instead of a sea.